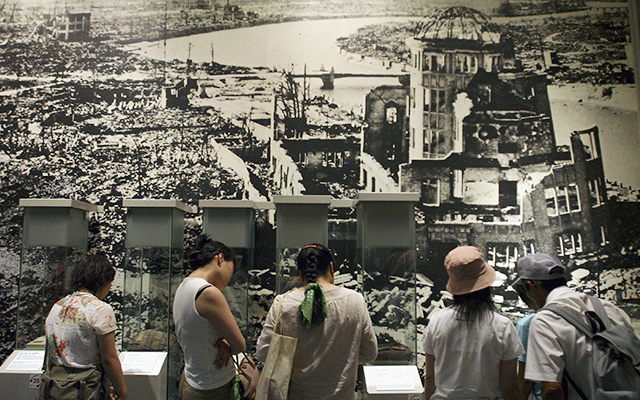 On Aug. 6, 1945, the United States dropped an atomic bomb on the Japanese city of Hiroshima, killing tens of thousands of people – many instantly, others from the effects of radiation. Death estimates range from 66,000 to 150,000. This first use of a nuclear weapon by any nation has long divided Americans and Japanese. Americans have consistently approved of this attack and have said it was justified. The Japanese have not. But opinions are changing: Americans are less and less supportive of their use of atomic weapons, and the Japanese are more and more opposed. In 1945, a Gallup poll immediately after the bombing found that 85% of Americans approved of using the new atomic weapon on Japanese cities. In 1991, according to a Detroit Free Press survey conducted in both Japan and the U.S., 63% of Americans said the atomic bomb attacks on Japan were a justified means of ending the war, while only 29% thought the action was unjustified. At the same time, only 29% of Japanese said the bombing was justified, while 64% thought it was unwarranted. But a 2015 Pew Research Center survey finds that the share of Americans who believe the use of nuclear weapons was justified is now 56%, with 34% saying it was not. In Japan, only 14% say the bombing was justified, versus 79% who say it was not. 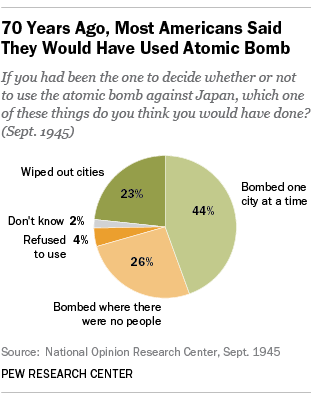 Not surprisingly, there is a large generation gap among Americans in attitudes toward the bombings of Hiroshima. Seven-in-ten Americans ages 65 and older say the use of atomic weapons was justified, but only 47% of 18- to 29-year-olds agree. There is a similar partisan divide: 74% of Republicans but only 52% of Democrats see the use of nuclear weapons at the end of World War II as warranted. In the years since WWII, two issues have fueled a debate over America’s use of nuclear weapons against Japan: Did Washington have an alternative to the course it pursued – the bombing of Hiroshima followed by dropping a second atomic weapon on Nagasaki on Aug. 9 – and should the U.S. now apologize for these actions? In September 1945, the National Opinion Research Center at the University of Chicago asked Americans what they would have done if they had been the one to decide whether or not to use the atomic bomb against Japan. At the time, a plurality of Americans supported the course chosen by the Truman administration: 44% said they would have bombed one city at a time, and another 23% would have wiped out cities in general – in other words, two-thirds would have bombed some urban area. Just 26% would have dropped the bomb on locations that had no people. And only 4% would not have used the bomb. By 1995, 50 years after Hiroshima and Nagasaki, support for an alternative to the bombing had grown. Gallup asked Americans whether, had the decision been left up to them, they would have ordered the bombs to be dropped, or tried some other way to force the Japanese to surrender. Half the respondents said they would have tried some other way, while 44% still backed using nuclear weapons. 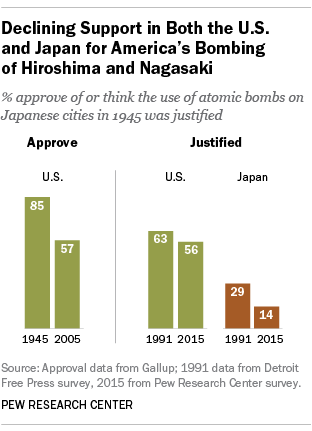 But this decline in American support for the use of atomic bombs against Japanese cities did not mean Americans thought they had to apologize for having done so. In that same Gallup survey, 73% said the U.S. should not formally apologize to Japan for the atom bomb attacks on Hiroshima and Nagasaki. Only 20% supported an official apology.